Washington’s Bailey Roberts delivers a pitch during a Frontier Athletic Conference game against the Hillsboro Indians Wednesday, April 3, 2019 at Washington High School. The Washington Blue Lion varsity baseball team hosted the Hillsboro Indians for a Frontier Athletic Conference game on a sunny and mild Wednesday afternoon. Hillsboro rallied from a 3-0 deficit, scoring seven runs in the top of the seventh to post an 8-4 victory. Humphries started for the Indians and pitched five innings. He gave up 10 hits and three runs (all earned) with four strikeouts and no walks. Warner came on to pitch one inning and got the win. He hit two batters and allowed one unearned run to score. Magulac pitched one inning with two walks and one strikeout. 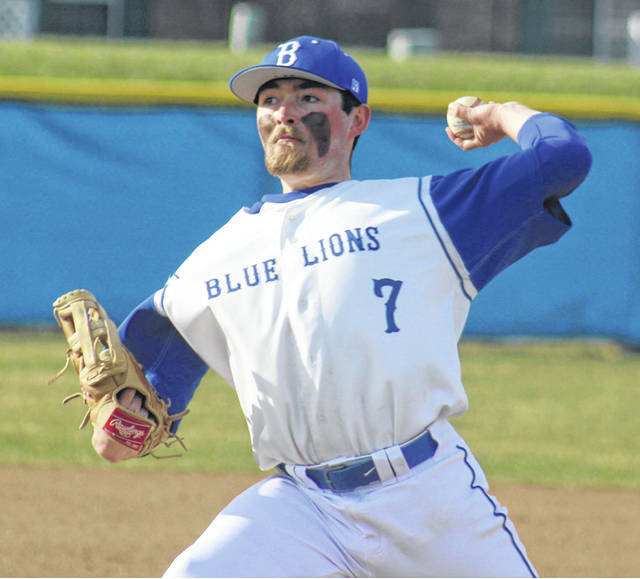 Bailey Roberts started for the Blue Lions and pitched six innings, suffering the loss. He allowed no hits with four runs (all earned) with three strikeouts and seven walks. He hit one batter. Cortez O’Flaherty pitched and allowed one hit and four runs (one earned) with two walks. Brock Morris pitched one inning with one hit and one strikeout. Six different players had hits for Washington, with Tyler Tackage going 2 for 3 with a double. Ryan Schwartz went 2 for 3 with two doubles, Roberts was 2 for 4 with one rbi; George Reno was 2 for 4 with a run scored; Karson Runk had one hit, Tyler Rood had one hit and drove in one run. Thompson and Magulac had hits for Hillsboro with Magulac’s hit being a double. Washington scored one in the second and two in third. Hillsboro scored one in the fourth and the score remained 3-1 in favor of Washington until the seventh. “Bailey pitched a great game,” Washington head coach Mark Schwartz said. “He was ahead in the count a lot. He let his defense do the work behind him. Up until the sixth inning, we had no errors, which was our best defensive game of the year. “I wasn’t sure how we’d react after that loss last night at Wellston,” Schwartz said. “We were disappointed with how we played and our approach at the plate wasn’t very good at all. We’ve been struggling hitting. We’ve had five hits in three games. Tonight we had several different players get hits. Washington (0-4, 0-1) is at Logan Elm Thursday and back home to play Chillicothe Friday at 5 p.m.
Offensively for Washington: Karson Runk, 1-3, 1 run, hbp, sb; George Reno, 2-4, 1 run, sb; Tyler Rood, 1-4, 1 run, 1 rbi, roe, fc, sb; Ryan Schwartz, 2-3, 1 run, 2 2b; Bailey Roberts, 2-4, 1 rbi, fc; Eli Shaw, 0-3, 1 rbi, sac fly; R.G. Crabtree, 0-2, 1 bb, sac; Tyler Tackage, 2-3, 2b, hbp; Hugh Silberman, 0-3. LOB: 10. Offensively for Hillsboro: Scott, 0-3, 1 run, 1 rbi, bb; Crum, 0-3, 2 runs, 2 rbi, bb, roe; Thompson, 1-4, 1 run, 1 rbi, sb; Watson, 0-3, 1 bb, roe; Boone, 0-2, bb, hbp; Magulac, 1-2, 1 run, 2 rbi, 2 bb, 2b; Priest, 0-3, 1 run, bb; Harless, 0-2; Haines, 0-0, 1 run, 1 bb; Warner, 0-2, 1 run, 1 rbi, bb. LOB: 5.